1. LAVINIA BENEDETTI Justice and Morality in Early Qing Dynasty Crime Fiction: A Preliminary Study. 2. CHEN XINYU The Hexagrams of the Yijing (Book of Changes) in Historical Studies - Li Zhi's Jiuzheng Yiyin. 3. MAX JAKOB FOLSTER Legitimation of a 'Marginal Dynasty': The Great Xia in Sichuan, 1362-1371 - A Case Study. 4. FOO YEE WAH, MARCO MECCARELLI AND ANTONELLA FLAMMINII China and the West in the Art of the Nineteenth Century: A Cultural and Historical Review of the Relations between Painting and Photography. 5. MARIA CHIARA GASPARINI The Silk Cover of the Admonitions Scroll. Aesthetic and Visual Analysis. 6. HO DAHPON DAVID Was Fujian a Frontier? State Policies and Seafaring Culture from the Heyday of Piracy to The Ming-Qing Wars. 7. LI GUOTONG Fujian Coast: The Home of Boundary-crossers in the Long Eighteenth Century. 8. OLGA MEREKINA The Old Catholic Church in Shanghai. A 350-year-old Treasure. 9. QIAN NANXIU Transformation of the Min (Fujian) Cainu Culture in the Late Qing Reform Era. 10. PAOLO SANTANGELO 'Disgust': Some Fragments of an Equivalent Feeling in Chinese Traditional Experience. 11. RENATA VINCI The Descriptions of Sicily in Chinese Travel Diaries and Geographic Works until Qing Dynasty. 12. YAN ZINAN A Change in the Poetic Style of Emperor Qianlong. A Study of the Heptasyllabic Regulated Verses on New Year's Day. 13. 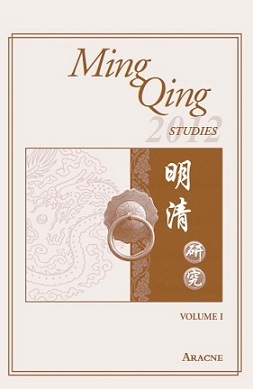 ZHAO JING A Comparative Literature Study on the Monstrosity and Transmissibility of Culture in Qing Dynasty. 14. DIEGO CUCINELLI Feline Shadows in the Rising Sun: Cultural Values of Cat in Pre-Modern Japan. 1. TOMMASO PREVIATO Imperial China and the Cultural Boundaries between Hua-Xia and Man-Yi - Toward an Holistic Conception of Ethnic Relations. 2. PAOLO SANTANGELO How Chinese scholars read Franks' Re Orient: some materials.